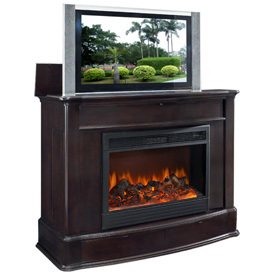 The sleek look of our Soho electric fireplace TV lift cabinet is a stylish look for any home. With its clean smooth lines and beautiful built-in 33” electric fireplace, it creates a sophisticated cozy environment for the whole family to enjoy. The firebox and TV are separated by a full wall. This wall allows your TV to remain cool and completely unaffected by the firebox. The Soho’s two bottom drawers are not only decorative but functional as well. The drawers offer plenty of room to store your audio-visual equipment. The two concealed side doors open to hide and store all of your media. You can enjoy your fireplace, watch TV, and have all your electronics hidden at the same time. This TV lift cabinet is offered in a caramel and espresso finish. Remote is included. Check out this beautiful TV Lift cabinet for yourself!